Google Suggest, the feature that autocompletes your searches with popular suggestions, has been enabled on google.com last year. 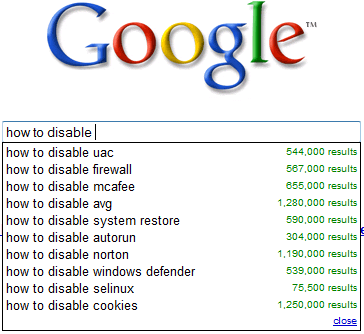 The feature is enabled by default and, like all the other Google Search preferences, its state is saved in a cookie. That means the settings can be changed only for the browser you're currently using and they're active as long as the Google cookie is not deleted. The feature can be disabled in the "preferences" page, from the "query suggestions" section. If your browser automatically deletes cookies when you close it, you'll probably find an option to add exceptions. For example, Firefox's settings page has a button titled "Exceptions" in the Privacy/Cookies section. Type "google.com" and press "Allow" to prevent Firefox from deleting Google's cookie. Changing the preferences for each browser you use is not very convenient. Some people like to use a portable version of their browser on a USB key (Opera, Firefox or even Chrome), others use software that synchronizes their settings (Moziila Weave is an example). Thanks Alex, It used the link to show Google suggest on all Google. It was annoying to find suggest on the main homepage first but how to keep that permanent? Alex, did y find a way to disable the automatic spelling check? Sometimes I get answers for misspellings I make on purpose, but they are already corrected by Google. This is useful information, but just a little off-topic niggle: I always cringe when American writers use the word "international" as a substitute for "non-US". "International" means something that crosses or transcends international borders. A .de domain, for instance, is not any more "international" than a .us domain is. If you mean "non-US", write so. Usually you can add a + in front of a word that is important and shouldn't be replaced with synonyms. Example: +britny +spirs. Thanks for your correction. I wrote from Google's perspective, since I don't live in the US. Alex - just to clarify....adding sites to Firefox cookie exception list does NOT prevent it from being deleted when you close Firefox. The exception list only lets you control which sites can or cannot place (drop) cookies on your computer. That's completely inaccurate. The exceptions list has a single purpose: creating special rules for some domains. "Access this window by clicking the Exceptions… button in cookies options. Here you can make exceptions from your general cookies options for specific sites. Using exceptions, you can allow all cookies, reject all cookies, or allow all cookies but have them deleted when you exit Firefox, regardless of your other cookie settings." I think Google Suggest is an excellently useful utility, saving time for all. However, I can't seem to get it to work anymore from the IE8 SEARCH BAR, no matter how much I fiddle with the settings, security, and cookies. Can someone suggest a fix please? Google Suggest is a loathsome pile of crap - I'm with Anon of June 5th. Probably one of the most irritating features I have ever encountered on software and right up there with Microsoft's paperclip help feature in Office but at least you could permanently turn that off! Thanks for the alternate URL, just for UK users info, this switch also works with the google.co.uk site. Hi, I'm not sure if you'll see this now, but this trick doesn't seem to be working any more for Youtube. I was using the Adblockplus filters, but the recent updates to Google must have changed things and now I'm getting suggestions again. Thankyou though, it was very helpful for a while. The auto suggest is a pain in the arse and I can't turn it off. Dumping Google, not happy about that but it is so irritating. THANKS TO THOSE STUPID SUGGESTIONS IT HAS RUINED MY NARUTO AND ONE PIECE FOR ME. I WOULD TYPE IN A CHARACTERS NAME AND IT WOULD COME UP WITH THEIR NAME AND NEXT TO IT "DEAD" OR "DIES". BETTER LAT THEN NEVER THOUGH.